7 degrees this morning on Shadow Mountain. About 10 inches of fluffy powder since Saturday night. 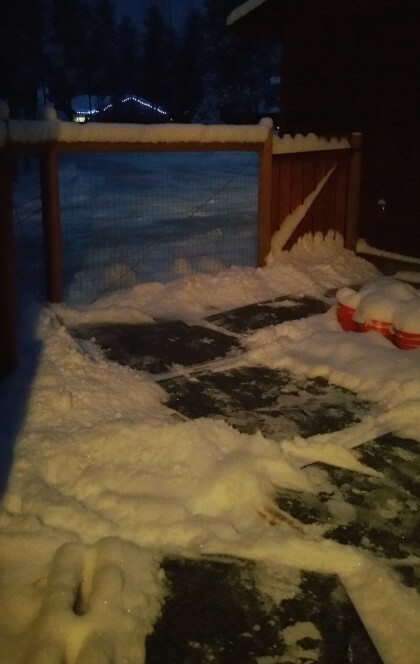 Fell yesterday clearing snow off our temporary decking, the palettes and stall mats I’ve shown before. Not hurt. Reminded, again, pay attention. 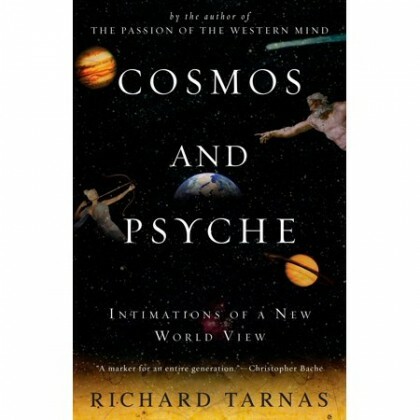 Cosmos and Psyche, by Richard Tarnas. Recommended by friend Tom Crane. I mentioned it a few posts back when I talked about skepticism as a tool, not a lifeway. This is an important work of intellectual history. I’ve finished the first section and, as I told Tom in an e-mail yesterday, my head is spinning. Tarnas points out, accurately I believe, the fundamental problem of our modern, Enlightenment inflected era. The application of reason and the scientific method created the Copernican revolution. Since that radical shift in humanity’s thousands of years old world view the ongoing advance of reason, buttressed, oddly, by monotheism, has in Max Weber’s wonderful phrase, disenchanted the world. The primal world view, the one held before Copernicus showed the earth and the other planets orbited the sun rather than the reverse, believed in a permeable barrier between human experience and the experience of an ensouled universe. Our inner world and the outer world, the whole vast outer world, shared vitality, intention, consciousness. Gods. Faeries. Cyclops. Shiva and Krishna and Brahma. The pervasive sense that trees and bears and moose and squirrels and the grasses and buffalo were as alive, in a spiritual sense, as humans. The weather, the climate, the shifting seasons, the phases of the moon. But, as the human mind, using its sharpest tools, reason and skepticism, saw through this primitive perspective, and, as monotheistic religions posited a creator who made a special creature, humankind, in their God’s own image, a gap grew between the human and the universe. Now, in the modern era, we look out from within to a morally neutral cosmos, devoid of soul or spirit, moving with randomness according to physical laws that, since we have discerned them, reveal the trapped, the determined nature of, well, nature. This disenchanted cosmos holds us, God’s special creation, categorically different and detached from the barren vastness that surrounds us. We are, in effect, alone, small, aware of our isolation, but with no purchase on anything outside the Cartesian split between spirit and matter. We have spirit and all the rest, matter, does not. This disenchantment and isolation, this sense of uniqueness, is, when viewed from above (not from within) a simulacrum of Lucifer Morningstar’s fall from heaven. With our hubris we have challenged the creation and in turn been ejected from it, living our short lives with no sense of our place in the universe. We gradually fought a war against anthropomorphism of the physical world, pulling back first from the notion of the earth as the center of the universe, then from the ensouled moon and the spirits of the our forests and streams and oceans, finally we separated ourselves from the evolutionary process by positing ourselves as conscious and all other living things as mere automatons. We pushed ourselves out of the garden, left ourselves to wander the earth, having to toil under the heat of the faraway sun for our food. The interesting turn comes next when Tarnas tries for a synthesis between the modern view and the primal view. Not sure where he’s going, but he has convinced me of the necessity to try. In another post I’ll talk about how, in an incoherent way, I’m already some ways down the path toward such a synthesis.